As the bull-buying season continues, I offer some simple reminders. 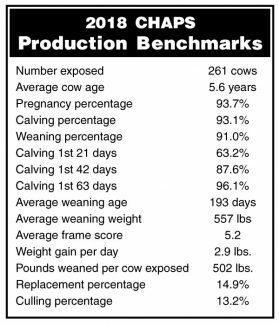 Every winter, I do enjoy visiting with producers regarding upcoming bull purchases and offer a workshop titled “Bull Buying by the Numbers” to help producers get a better understanding of what the numbers mean. Participation is geared to help individual producers streamline their bull-buying strategies to meet their individual goals and objectives. The worry is sometimes that, as an educator, I will present the proper bull to buy, thus narrowing the thousands upon thousands of bulls that are available to a set few. Or, even worse yet, that I will give some sort of nod to a particular bull breed. Both statements are absolutely false. Bull-purchasing advice and the workshop are designed to help producers think through and envision where they feel they are at in the beef business. In other words, are they content with the cattle they are producing? No judgment is offered; no recommendation is made as to the ultimate cattle type. The answer remains in the hands of each individual producer. The offering and opportunity to improve one’s bull buying are not dependent on the breed of bull but rather a clear understanding of a producer’s management goals. What also is important for a producer is to know the genetics of current and previously purchased bulls. Step 1: Start by reviewing all the available expected progeny difference (EPD) traits from the breed database. The breed is obviously the breed of bulls that have been purchased previously. If the registration numbers are lacking, get them from the sale catalogs used to buy the bulls or call the bull breeder directly. In the meantime, move over and join a producer who has the registration numbers. Step 2: Identify the traits of interest. You can choose from among many traits. I like to pick birth weight, weaning weight, yearling weight, milk, rib-eye area and marbling. Why? These are the “touchy feely” traits a producer can visualize and the numbers are associated with real, touchable outcomes. The EPD trait discussion is decades long, but comprehension is lagging, especially for those traits that involve minus and positive numbers and/or arbitrarily assigned scores. Those can be evaluated later at a producer’s leisure. The Dickinson Research Extension Center goes through this same process with each bull in each breed. As a producer, you would want to include all your current bulls (and historic bulls if you wish), working with each breed separately. For this example, I selected two Angus bulls in the center’s bullpen: bulls 17628526 and 17698292. To complete Step 2, search the Angus database by registration number. Bull 17628526 has a birth weight EPD of .1, weaning weight EPD of 53, yearling weight EPD of 97, milk EPD of 22, rib-eye area EPD of 1.01 and marbling EPD of .47. Bull 17698292 has a birth weight EPD of minus 2.5, weaning weight EPD of 46, yearling weight EPD of 85, milk EPD of 19, rib-eye area EPD of .72 and marbling EPD of .40. As a producer, you hope you will have several bulls to list within a breed, with the goal being a list of at least six previously purchased bulls. Step 3: Average the EPD values for the listed bulls. The average EPDs of the two previously listed center bulls are a birth weight of minus 1.2, weaning weight EPD of 50, yearling weight EPD of 91, milk EPD of 21, rib-eye area EPD of .87 and marbling EPD of .44. The series of averages is indicative of the genetics based on the EPD values of the current sires. Depending on what changes a producer desires, bulls can be purchased to change the bullpen average in the desired direction. At the center, if we want to increase weaning weight, we would want to bid on bulls with a weaning weight EPD greater than 50, the center’s current average for EPD weaning weight. The same principle works for all EPD traits and illustrates that once a producer knows the average EPD values in the bullpen, bull shopping has a focused point. With time, once a producer not only understands but comes to actually utilize the individual trait EPDs for potential bull purchases, the value of utilizing EPD index values starts to make sense. Write the index values down and ponder them as you find the bulls with the desired EPDs. Now buy the bulls that move genes in the desired direction.